Okay so, as you may be guessing, today is a “lineart now colors later” day. If you want the long version of what would have been in today’s strip, check the Director Commentary. The short version is that the original version kind of led into a derail where everything focused on Moonsong and his blind left eye for like three pages. 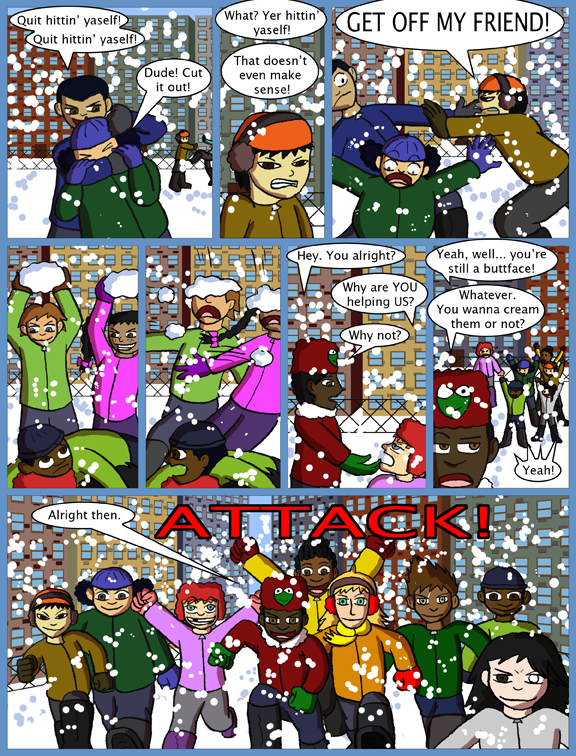 So, as the regular blog post mentions, the strip shown here is not the original scripted installment for today. It's actually very very different. The original version of this strip focused pretty heavily on Moonsong. I've had him planned out from the beginning as being blind in his left eye (hence the bangs covering it), but initially and for the past three years up until now I had intended for him to have a false glass eye, not just a blind eye. The original script for today had Moonsong take a snowball to the back of the head which popped out his false eye. While he was scrabbling on his hand and knees to find it and trying to call a Time Out, Michael made ready to lob another snowball at him, only to be stopped by a barrage of snowballs from Keisha Heather and Ricky. Sandy runs up to Moonsong expressing concern over his false eye being popped out and the action sort of pauses while he looks for it. Ricky finds it in the snow and picks it up, only to be grossed out by the residues left on it ("Eeew! It's all slimy!") Moonsong snatches the false eye out of Ricky's hand angrily and glares at him. With his hair being blown to the side and his empty socket exposed Moonsong retorts to Ricky, "Of COURSE it's slimy! It's been in my head!" I've had that scene and the "Of COURSE it's slimy! It's been in my head!" line running around my mind for almost as long as Moonsong's been around. In fact, the original draft of this snowball fight arc was ALL ABOUT the reveal of his false eye and Moonsong's "origin story" before I rewrote it to focus on Selkie. But as the snowball fight built up to the "Moonsong loses his false eye" moment, I started thinking about all the complications it brought up and it felt less and less like a good idea to have included in the arc. Even if I chose to ignore the fact that the whole scene is unnecessary and does nothing but add ANOTHER character thread to the arc, the whole image of Moonsong having a false eye pop out and run around with an empty socket has a lot of squick and gross-out factors involved that would only detract, and not add, to the whole. And I had already been drawing his "false eye" as if it were a "blind eye" anyway, so taking the extra time out of the arc to emphasize and draw attention to it brought nothing to the table. In the end, I chose to re-draw and re-write this strip to focus more on the group as a whole galvanizing and banding together. Which has the benefit of greatly shortening the time away from Selkie's crisis. And as for the false eye, since I was already rendering it as a blind eye anyway I decided to null the false eye premise and just leave it exactly as it appeared to be: a blind left eye. There is a kinda Marvel feel to that last panel. Long-haired kid in front kinda reminds me of Thor, although with just one eye he should be Odin. Behind him, the kid with the spiky hair, next to Heather, looks like the Human Torch. I see The Thing in George, and right in front center I see that little green frog covering the entire body. ‘Cause if that’s not The Incredible Hulk’s pose, I’ve never seen it. Oww, that one hurt. Off the top of my head, from left to right. i think his eye looks awesome in black and white, was the first thing i noticed. Indeed. I run into that with Shards when TB has roleplayed it with friends and says such and such happened but in the end it unrealistic or better for the story to portray it another way, or simply to rewrite it. I should add those notes in the strip, huh? 🙂 For instance, blowing up the werewolves? My idea. I was atwix as to whether to follow through with the original plan of Velvy, Alice, etc. setting off traps Red had already set in the town hall after catching the werewolves or not. I am adding a note now about a previous strip for tomorrow’s strip posting:) Check it out! It’s hard to have a normal worldview when the world you view isn’t normal…. Optionally? Braver man than I.
I’m not absolutely certain, but the few folks I’ve known who had glass eyes didn’t have any slime on them since the socket is pretty much healed over on the inside. So truthfully, unless there is some kind of infection in the socket there really shouldn’t be anything on the glass eye to begin with. It’s said that, when “Arrival of a Train at La Ciotat” was first shown by the Lumiere brothers, the audience panicked at the sight of the locomotive heading towards them. Wow, STILL no teachers? This must be some of the most irresponsible supervising I’ve ever seen on a playground, regardless that they’re elementary age. @Dean. You’ve obviously never been to Seattle than. Just a quick stroll around Pike Place market will show you a more diverse mix of people than Dave has in his entire comic combined. @Dean. What Marie and Pashakitty said? It’s the same where I live. Dude, “variety is the spice of life” and all that. LOL! I know, he DOES look just like Todd in the beginning doesn’t he? It was kind of weird seeing that panel, since we hadn’t seen that antagonist before and his outlines were exactly like Todd. So, how will this play out with Selkie’s “they’ll see them throwing snow but not us” plan? For the record: Chanelle got edited into the last two panels afterwards, in order to fix a plot-hole. Therefore she’s not mentioned in my comment. I…I want to adopt Moonsong. He’s my perfect child. And now he’s a bit of a woobie, and I just want to wrap him up in my arms and tell him it’s okay! Bonus art! Bonus art! So yeah, bonus art of what you described in the commentary would make my day. Even if its just a sketch. This isn’t a snowball fight…this is a complete RIOT.